Since I wrote my post about the great 19th Century German landscape artist Caspar David Friedrich back in 2006, many additional resources for viewing his work have appeared on the web; and there is a new exhibition of his work, Caspar David Friedrich — Nature Animated along with a complimentary exhibit, Friedrich, Eight Contemporary Commentaries at the NationalMuseum of Sweden (to 10 January, 2010). Friedrich was a prolific artist, however, and there is finally an abundance of web resources to view his work as he regains popularity with contemporary art lovers. His popularity waxed an waned during his own lifetime. Friedrich had success in the early part of his career, but fell into disregard and even disdain in the latter part of his life, a life that was marked by tragedy of various kinds almost throughout. I remember seeing a print of his “Cloister Graveyard in the Snow” as a kid in High School. I believe it may have been one of those pieces you mentioned being destroyed in World War II. Because of that painting I’ve never quite gotten over the romantic vision in art. I’m glad to see Friedrich getting more attention. I’m very fond of his work. I feel fortunate that I got to see “From Friedrich to Richter” at the Getty Center a couple of years ago – I’d like to see more! Thanks for the update. I really like you’re blog and I’m quite into the works of Caspar David Friedrich as well. One of my favorites is the “Monk by the Sea”. I’ve been fortunate to have seen Friedrich’s work at the Hamburg Kunsthalle, he’s my favourite artist. It’s really great to see continuing exhibitions of his important work, and the appreciation and acknowledgement of his influential contributions to art and its history. If you are a passionate art lover and you have a thing for landscapes, you might want to check out this app entitled “Friedrich”. Landscape painting is a unique for of art, since nature is a sublime subject to tackle. Only those with the skill to capture and depict the raw beauty and dynamism of nature can only be considered as a true master. One of the most prolific German painters is Caspar David Friedrich who known as a Romantic Landscape painter. His works were always contemplative, allegorical and full of meanings. Now, if you are interested into looking at his drawings and works that are seldom shown, you can access an app that can reveal to you high resolution drawings straight to your iPad. Friedrich has always been a romantic, and even at the end of his career, he remained the same, which was his major downfall since the art movement is moving forward to more radical artistic ventures. With this application, you will find rare prints of his drawings that are hard to find. If you have always been in love with landscapes and you love to paint or take pictures of land forms, this app will definitely appeal to you as a resource. Finding the beauty in nature in a romantic light is quite difficult. With these images, you will see how a creative genius like Friedrich manages to create the most stunning landscape illustrations. 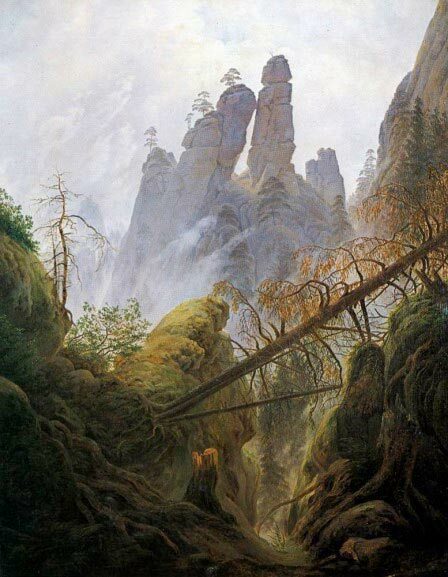 The fact is that we do not see landscapes like Friedrich did. It is interesting to see what kind of stories and characters have walked in these beautiful and fantastical landscapes that he did. This is a really good app that you should have if you like landscapes and maybe even story telling. It sets the mood and it creates a perfect setting to become inspired.